Companies that regularly engage with candidates in their ATS typically see a 76% increase in placements from existing candidates. While ATS’ are great for collecting data and tracking processes… they’re not great engagement platforms which can lead to hidden pools of talent. By definition recruiting is an endless hunt for talent. Receive a req, fill it with the right candidate, rinse and repeat. While perhaps not the most flattering definition of the industry, those are its bare bones; what recruiting professionals do, either directly or indirectly, every day. It makes sense then to make the hunt for talent as efficient as possible. The quicker you find the best candidates, the better at your job you’ll be. But it’s in this most basic of recruiting creeds that a stunning amount of firms and professionals miss a major trick. Applicant tracking systems tend to get a bad rap. Listening to complaints of ‘it’s too messy’, ‘I can never find what I’m looking for’ and ‘half of the information is out of date’, you’d wonder why a recruiting firm would even bother using one. However, these misgivings not only obscure the truth, they place blame on the system itself, not on those who are in charge of managing it. When used correctly an ATS is the most valuable tool a recruiter has at their disposal. According to figures published by Capterra, no less than 94% of recruiting firms and HR professionals who used an ATS said it improved their recruiting process. The reason? 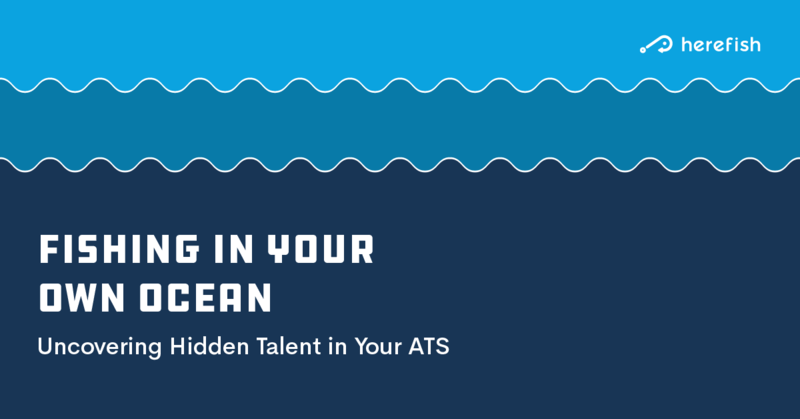 An ATS turns the endless and sparse sea of available talent into a veritable fish farm; your very own ocean, packed with the exact type of candidate you’re always looking for. You should be able to cast a rod in and be confident of pulling out a prize catch at any time. In-line with the anti-ATS comments above, recruiting firms don’t always capitalize on these systems as they could and should. The farm falls into disrepair, the quality of the fish starts to slide, and before long you’re once again looking at that big wide ocean in the hope of catching something better. The numbers back this antipathy up. Despite the excitement over the way an ATS can improve a firm’s recruiting processes, on average just 10 – 13% of the candidates in any given staffing firm’s ATS will actually engage with a firm, whether through simple emails, phone calls or text messages. Imagine feeding just 1/8th of the fish in your farm (to overextend an already stretched metaphor). This means a staggering 90 – 87% are left alone. With no dialogue between candidate and recruiter, the information on these individuals is soon out of date. 60% more likely to list your ATS as the top source of hire. Constantly sourcing new candidates is an incredibly inefficient way to make placements. Even if your external sourcing process is automated, searching for, finding and processing new candidates is time consuming and costly work. It’s a vicious cycle – the more you disregard the candidates in your ATS, the more reliant you become on sourcing new ones, and before long you’re stuck on a hamster wheel of constant sourcing. But the best and most efficient recruiters understand the wealth of talent that will be available to them if they take the time to nurture the candidates already in their ATS. Creating a perfectly maintained ATS that continually serves up prime candidates takes work…recruiting automation to the rescue. First you’ll need to clean up the data. We’ve talked about this process in depth before, but in simple terms you’ll need to identify incomplete records and ideally offer candidates a chance to update their own data or opt-out of the talent pool altogether. Next you must maintain the integrity of the data. This is where a lot of firms fall down, beginning that slow slide into forgetting about the talent pool right under their collective noses. To avoid that outcome you need to put robots to work and find ATS records that don’t meet your business standards. For example, find every record without an email address or that hasn’t had any activity in 2 years. Remember: if you put crap in, you get crap out. Finally, and (in this article at least) most importantly, nurture your candidates. Engage them. This doesn’t mean a weekly call to every single one of the candidates in your ATS, but it does mean regular emails, regular job invitations, and regular chances for interaction with your firm’s recruiters and salespeople. Continuous candidate engagement rather than the industry average makes you 60% more likely to list your ATS as the top source of hire. Where your competitors are casting out their line in hope, you’ll be dropping your bait directly on top of a school, placing your feet in the stirrups, and reeling in the catches one after another.